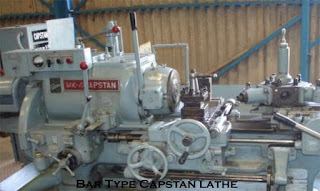 (a) The Capstan or Ram Type Lathe - The ram type turret lathe or capstan lathe as shown in figure below, carries the hexagonal turret on ram or a short slide. 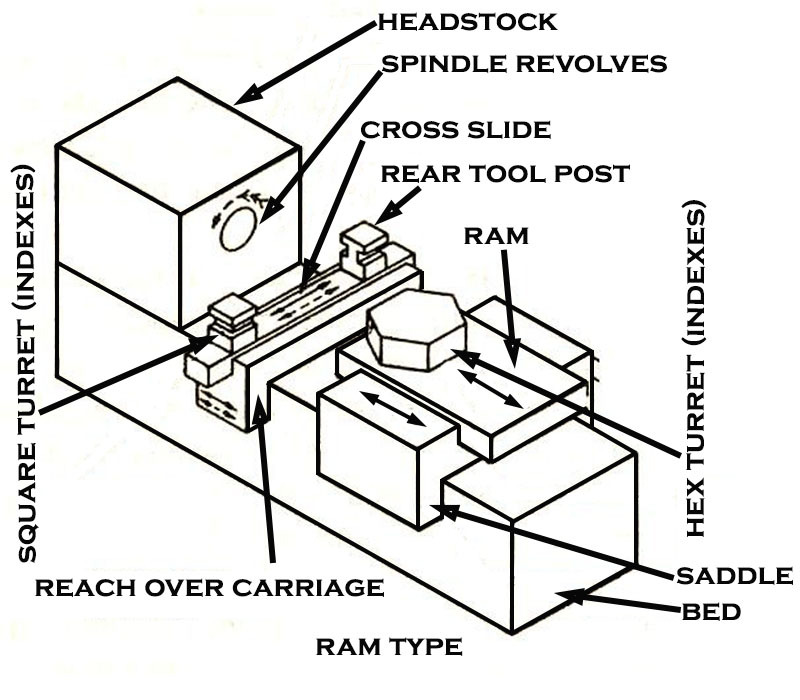 The ram slides longitudinally on a saddle positioned and clamped on lathe bed ways. This type of machine is lighter in construction and is suitable for machining bar of smaller diameter. The tools are mounted on the square turret and six faces of the hexagonal turret. The feeding movement is obtained when the ram moves from left to the right, and when the ram is moved backward the turret indexes automatically and the tools mounted on the next face comes into operation. 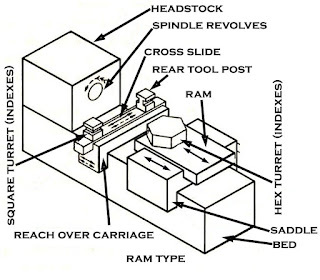 (b) The Turret or Saddle Type Lathe - The hexagonal turret as shown in figure is mounted directly on a saddle and the whole unit moves back and forth on the bed ways to apply feed. This type of turret lathe is heavier in construction and is particularly adapted for larger diameter bar work and chucking work. The machine can accommodate longer work pieces than that in a capstan lathe. These machines are also divided in two groups according to the type of work they perform. (a) Bar Type - These types of machines are fitted with collet chuck and are suitable for producing jobs from bar stock. These are mainly used for mass production of identical parts from bar stock. (b) Chucking Type - These machines are equipped with three or four jaw chuck and have a varied application. These are capable of machining jobs of different shapes and sizes, including the bar stock. The main application of these machines is machining of individual items like castings and forgings. (a) Maximum diameter of the job that can swing over the bed. (b) Length of the job, which can be held in between the centres when the turret is at extreme end. Same, as in case of a Turret lathe. Usually a single tool post and can hold maximum 4 tools. Its cross slide carries a square type tool post as well as a tool post as its rear, which can hold 1 or 2 tools at a time. It carries a tail- stock which is used to support the job and to hold some cutting tools also, like drills and reamers, when some operations are to be performed at the end face of the work piece. It carries a hexagonal indexable turret head, a tool or tool head can be mounted on each face and which can be indexed in sequence. It also carries a square, round or hexagonal turret, which provides the same facility of mounting and indexing four to six tools as in case of a turret lathe. Always provided to enable thread cutting by single point tool. In place of Lead screw, Leaders and followers are provided to perform thread cutting operation of non standard threads. Whatever time is spent is in the initial setting. Thereafter, no time is lost because all the tools are present for each operation in sequence. In short, an engine lathe is a versatile machine capable of machining any or every type of jobs within its limit. The machine is unsuitable as a production unit as considerable time is taken to set different tools on the tool post of the lathe after each operation and for each job. 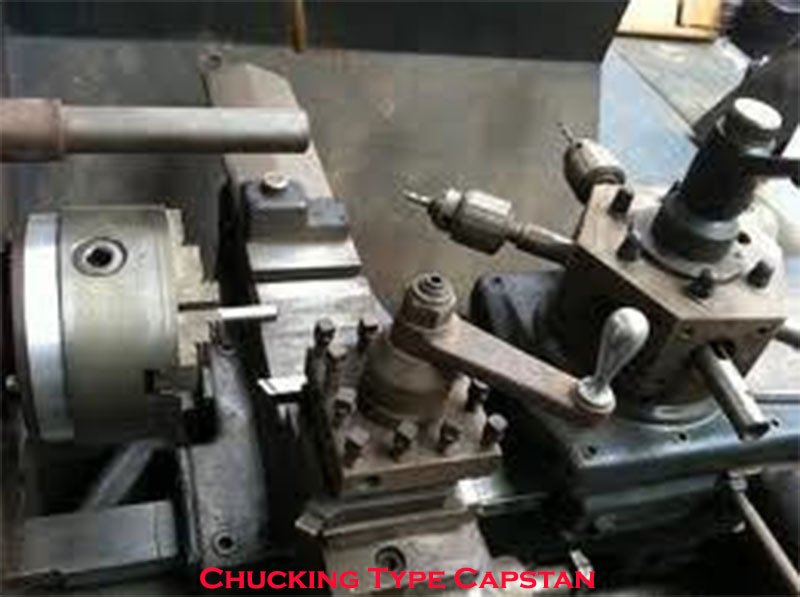 On the other hand, the capstan or turret lathe is a mass production machine. They are unsuitable where only one or few jobs are to be machined. The high initial setting time compared to an engine lathe does not justify its use in a single or few numbers of jobs.